Anthony Sequeira, CCIE No. 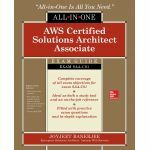 15626, is a seasoned trainer and author regarding various levels and tracks of Cisco, Microsoft, and AWS certifications. In 1994, Anthony formally began his career in the information technology industry with IBM in Tampa, Florida. He quickly formed his own computer consultancy, Computer Solutions, and then discovered his true passion–teaching and writing about information technologies. Get complete coverage of all objectives included on the February 2018 SAA-C01 exam from this comprehensive resource.